The best player in the game, LeBron James had quite a busy night last night as his Cleveland Cavaliers were hosting the Oklahoma City Thunder led by Kevin Durant and Russell Westbrook. In addition to that, he almost splattered a lady in the first row, the wife of golfer Jason Day. Every NBA fan was super excited to see LeBron and his team match up with Durant and Westbrook’s Thunder who have been playing really well as of late. Everyone was wondering if LeBron could handle Durant’s insane scoring skills and the triple-double machine that is Russell Westbrook. In short, he can and he did. King James did his thing and the Cavs won 104-100. The Thunder were dictating the tempo early on and Durant increased their lead to 22-15 with a reverse layup in the style of Dr. J with his head behind the backboard and his arm extending in miraculous ways to score. He once again exhibited skills that a guy that big should not have. Russ was also doing his thing, dishing out mad assists and penetrating like only he can. Half way into the second quarter, the Cans went on a run and by the end of the first half, they all but tied the game up. Two teams would trade blows in the third quarter, with a few mini runs by each team. In the fourth quarter, LeBron was everywhere, getting rebounds, scoring and assisting. Kevin Love also contributed with two timely threes, one of which was a 3 plus 1. LeBron ended the game with 33 points, 9 rebounds and 11 assists. Westbrook had 27 points and 10 assists while Durant added 25 points for the Thunder. However, the scariest moment of the game involved LeBron and not a player on the other team but a spectator. 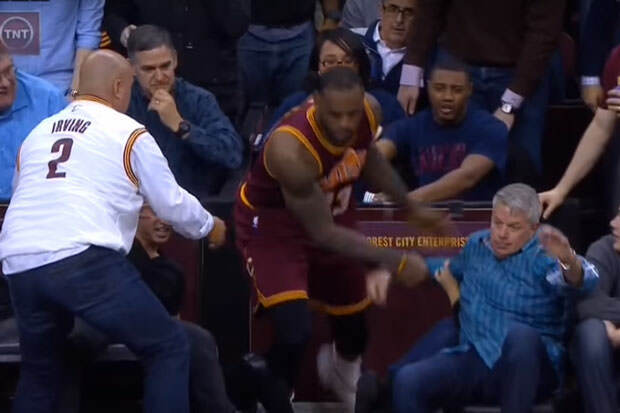 Namely, in the heat of the game, LeBron jumped in the stands in order to save a ball that was going out of bounds. He was unable to control his body and he slammed into a lady who was sitting in the first row, Ellie Day, wife of golfer Jason Day. He landed on her and she had to be carried out of the arena on a stretcher. The latest news is that she is okay and that she was discharged from the hospital early this morning.